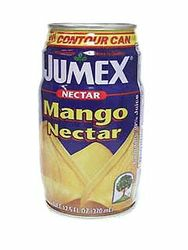 Single serving of tropical mango juice. A Vilore product. The mango is the most popular fruit in the world. The origin of the mango most likely lies in the Burma-Melanesian regions of Southeast Asia. Mangoes have been cultivated for more than 4,000 years in India where the mango is traditionally appreciated as a religious object by Indians. Cultivation of mangoes slowly spread to tropical and subtropical countries. It is said that Persian sailors introduced mangoes to East Africa in the 10th century A.D., while Portuguese travelers of the 16th century brought them into West Africa and South America. Mangoes were introduced in Mexico about 1775 and trees are now harvested in 24 states. The main states exporting mangoes to the United States include Michoacan, Sinaloa, Nayarit, Jalisco, Veracruz and Chiapas. The U.S. imports mangoes mainly from Mexico, Haiti and Guatemala from February through September. The flavor of the mango is described as a delicate blend of peach, pineapple and apricot flavors, the perfect mixture of sweet and sour. The flesh of the ripe mango has a buttery texture surrounding a large, flat, inedible seed in the center. The mango is a comfort food. Mangos really can make you feel better! Beyond being delicious and rich in vitamins, minerals and anti-oxidants, mangos contain an enzyme with stomach soothing properties similar to papain found in papayas. These comforting enzymes act as a digestive aid and can be held partially responsible for that feeling of contentment. Mango is a very good tenderizing agent due to these same enzymes, therefore ideal to include in any marinade. An average sized mango can contain up to 40% of your daily fiber requirement. Mangos are also a great way to replenish that lost potassium. Deliciously rich in anti-oxidants, potassium and fiber - the mango is the perfect fruit! Mangos are an excellent source of Vitamins A and C, as well as a good source of Potassium and contain beta carotene. Mangos are high in fiber, but low in calories (approx. 110 per average sized mango), fat (only 1 gram) and sodium.